Since the weather in London has been surprisingly good for September, I have been resisting the temptation to be boring and put on a pair of jeans and instead have been opting for dresses. 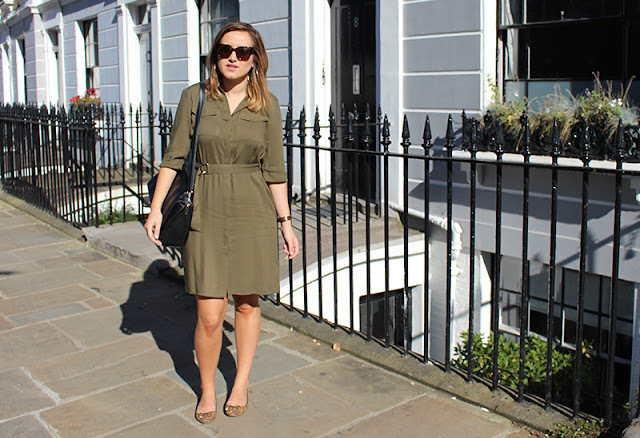 I recently picked up this utility dress from Topshop which I really love, the colour is perfect and I do love a good shirt dress as I think they’re really versatile all year round. 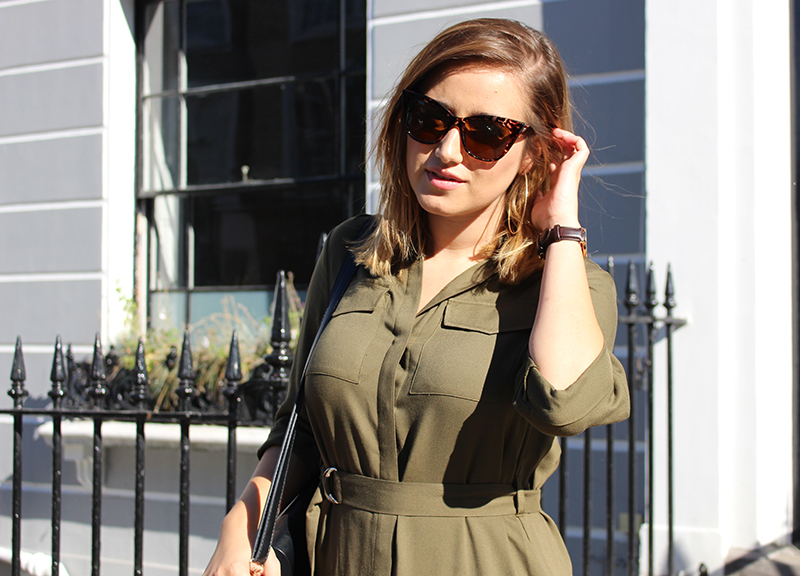 Since it was a day look and I had a lot of walking to do I just teamed the dress with a pair of leopard flat, Daniel Wellington watch, my usual handbag and sunglasses. It’s nothing fancy or groundbreaking but I really like it and I’m really enjoying the weather too! The reason I was brave enough to bare my legs in autumn thanks to the Braun Silk-epil 5 wet & dry, as I usually hide my legs as soon as August ends. Braun asked me to take part in the 30 days of switch up your style campaign, which I agreed to as I love the idea of always being outfit ready all year round. I will admit that I usual start to show my legs a little less love in autumn and winter, which is awful as I am always left with only trouser or tights options. I started epilating about a month ago now, I get my legs waxed in the summer but it can be very costly and time consuming all year round so I swapped over to epilating and have really been enjoying it. It’s not as painful as I thought it was and I even use it on really short hairs meaning I don’t have to wait too long between epilating sessions. The Silk-epil 5 Wet & Dry can be used in water or out which I love as I find using it in the shower can help open the pores in my skin and really reduce any sort of discomfort. Adding the Braun Silk-epil 5 Wet & Dry to my routing has made my morning routine so much easier as I don’t have to worry about shaving my legs but even more exciting is that my legs are now always ready for a great skirt or a beautiful dress, even if I was feeling particularly lazy that morning! If you also want to join me in the #BraunBeautyChallenge then share your photos with the hashtag, get them pins on show before it gets too cold! How do you get your legs ready for your favourite dress/skirt? It seems every brand is releasing a facial cleansing brush and they all seem to do pretty much the same thing. That’s why I was excited to find out that the Braun Cleansing brush does more than just cleanse your face but it’s also a facial epilator! 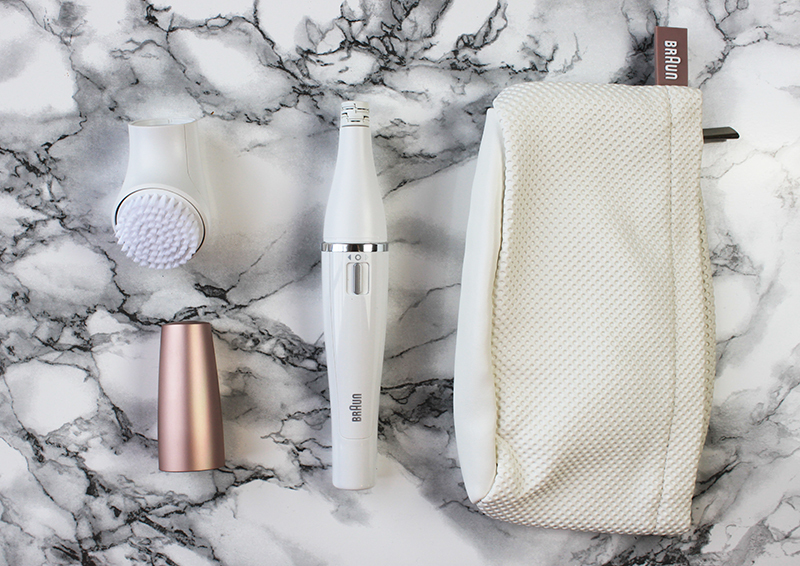 The Braun 2 in 1 Cleansing Brush and Epilator is the world’s first- it cleanses the skin, as well as removing any unwanted facial hair from the root. Since Braun is the world No1 epilator brand, the first thing I tried was the epilator function which removes even fine, shorter hairs. The size makes it perfect for tidying up eyebrows in between brow waxes to avoid any sort of monobrow or to de-fuzz the upper lip area (no Movember here!) I personally like to do my upper lip at home as I feel it doesn’t require much skill or precision and also means I don’t have to stick to appointment times but I hate having to heat up wax for such a small area- which is why this is perfect. 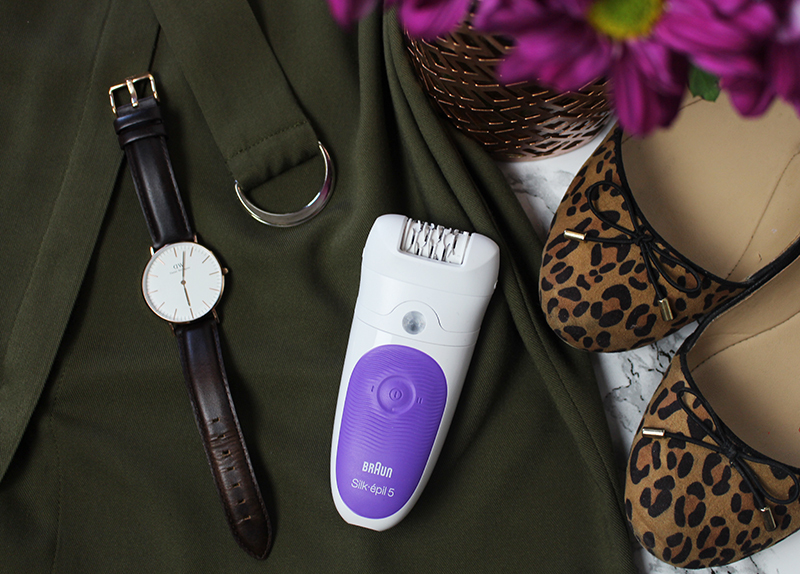 You don’t have to wait for it to heat up and there is no mess, you simply attach the epilator head and remove all your unwanted hairs, even those short hairs that waxing can’t remove. Most people worry about the pain of epilating which isn’t as bad as it use to be and I would say it’s similar to that of threading, so nothing to be too worried about. 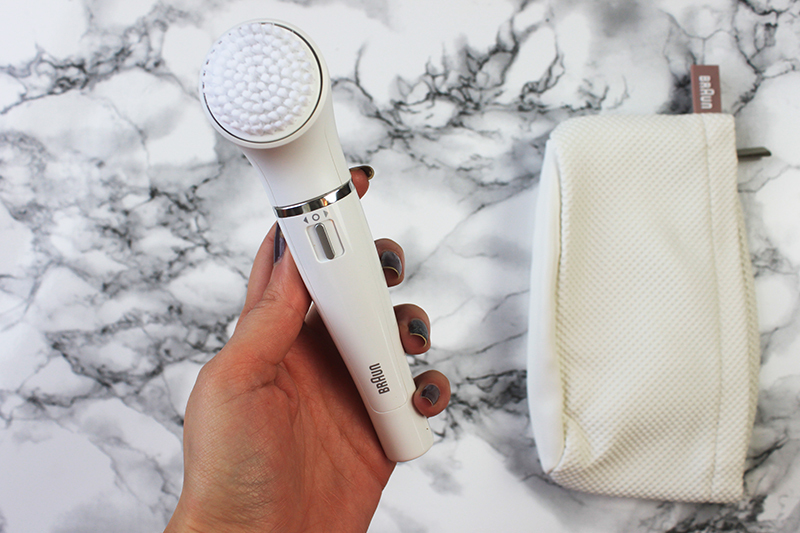 What I first noticed about the cleansing brush, is that it’s a little more gentle than most that I have tried, which is a real plus for me. I find that although it deep cleans my skin and pores, it doesn’t irritate my sensitive skin. 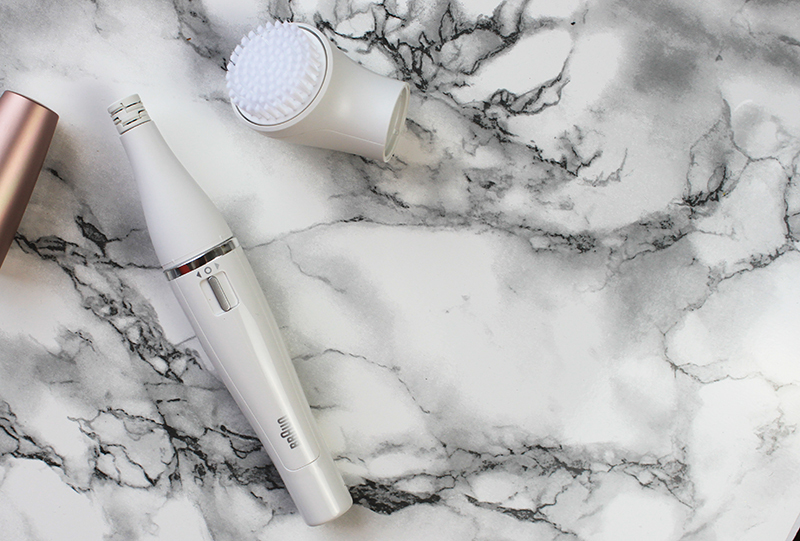 It’s the perfect tool to help you achieve flawless, smooth skin. It’s all fairly compact, comes with a cover, storage pouch and lighted mirror- making it the perfect travel beauty gadget or simply to be stored in your handbag/work drawer for hairs that need immediate attention/removal.